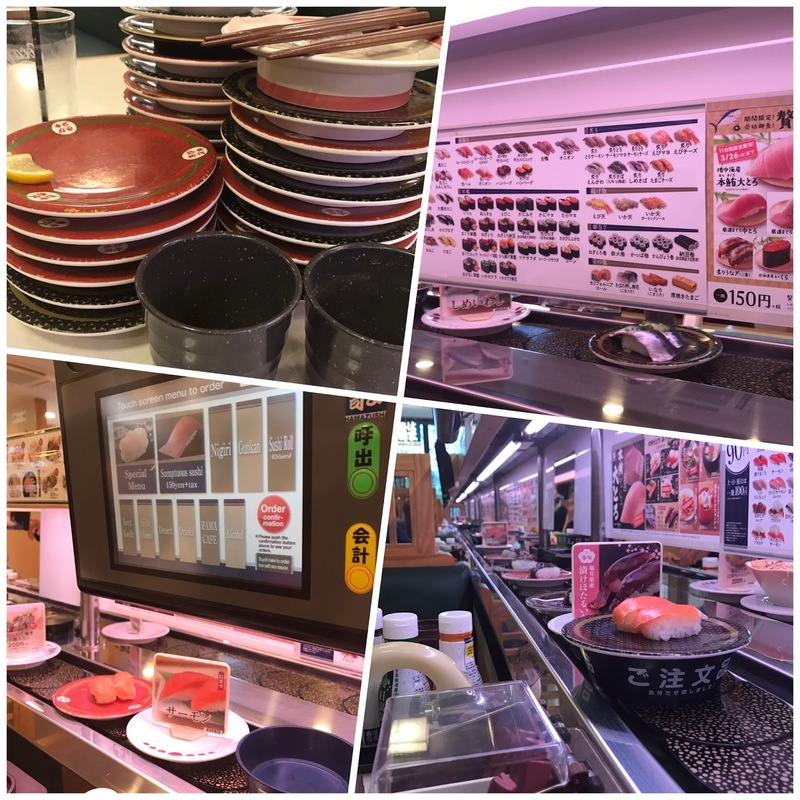 Conveyor belt or kaiten (revolving) sushi is hardly uncommon outside Japan, but the Japanese version (like many things in Japan) is both more automated and more efficient. On entering, if the restaurant is full (which is often the case) you enter the number of people in your party and preference (table/counter) and get a numbered ticket: when your number is displayed, you are taken to your seat. After sitting down, you take what you want as it passes by or else order through the computer panel (pictured bottom left) in either English or Japanese. Soups and drinks are usually brought to you by a server but everything else comes along on the belt. Once you're done, you press another button to call over the server who counts your stack of plates (pictured top left) in the blink of an eye and prints out your bill. You then go over to the cash register to pay. Very smooth! 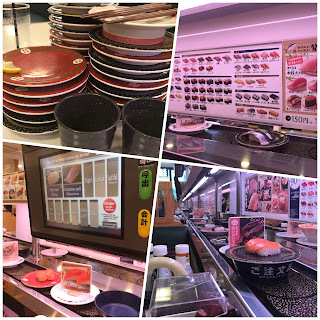 At Hamazushi, one of the largest chains in Japan you are certainly not limited to raw fish. Tempura and meat sushi, including duck, hamburger, and raw ham, are available, as are seaweed rolls and sushi wrapped in seaweed (known as gunkan or battleships). There is also an extensive side-menu, which includes everything from chips and salad to fried chicken and green boiled soybeans (eda-mame). Finally, there is even dessert, including fresh fruit! One top tip is to order rather than simply take what's passing: this will be freshly prepared just for you and arrive in a few minutes on top of a black bowl (pictured bottom right in the picture above) which reads go-chūmon hin (ご注文品=ordered item）. This ensures no-one grabs it before it reaches you! All for only ¥100 (70p/90c) a plate for most items - less on weekdays!